Maricaulis maris, copyright Patrick Viollier. The Rhodobacteraceae are a diverse group of Gram-negative bacteria including both photo- and chemoheterotrophic taxa, primarily found in aquatic environments. [SH03] Strömpl, C., G. L. Hold, H. Lünsdorf, J. Graham, S. Gallacher, W.-R. Abraham, E. R. B. Moore & K. N. Timmis. 2003. Oceanicaulis alexandrii gen. nov., sp. 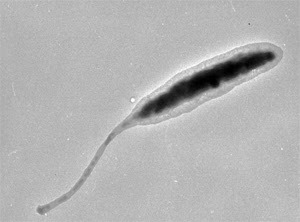 nov., a novel stalked bacterium isolated from a culture of the dinoflagellate Alexandrium tamarense (Lebour) Balech. International Journal of Systematic and Evolutionary Microbiology 53: 1901–1906.